Tomorrow will be anti-climatic. It just will...that is the nature of holidays for me. They are never as good as they could be, or as good as they have been in the past, or as good as your friend's/neighbor's ends up being. So I have resigned myself to accept this fact, and I have very few expectations for holidays...which makes them better. Plus, I think that a lot of it is fabricated. The decorations, the parades, the emotions. It feels like Ground Hog Day (the movie). Every year is just a repeat of the same darn thing you did last year. 'Sept maybe (no idea why I am talking like a hick now) you have a blue snow cone at the carnival this year, where last year you had a pink one. I know that there is a lot of comfort in repetition for children. Dalton loves that every year when he goes to Onion Days, down in Payson, he is going to ride on the exact same puke-o-ramma ride, that is set up in the exact same part of the park. He is going to buy the exact same tattoos, from the exact same booth, and he is going to get the exact same Tootsie Rolls that he will catch from the same local boy scout float. If anything changed, it would rock his world...make him question the laws of the Universe. But thankfully, nothing changes, and all the kids can breathe easy. I don't know...I just can't fake it. Maybe that's my problem. So, back to today- it is the 3rd of July. Oh, the blessed 3rd! No expectations, no cakes in the shape of flags, no sparklers, no crafty decorations...just a sunny day with the family. It was beautiful. So, I'll be honest...I had intended to spend the morning cleaning the house, as Shelby and Dalton were supposed to be playing at a friend's house. But it turns out that the Mom really needed a little break for the day so I ended up having the foursome. Luckily Gavin was off work and could stay home while the baby napped. So, I packed up a lunch of desperation. Two left over grilled chicken breasts from last night's dinner, a half a loaf of wheat bread, four plums, a half a bag of BBQ chips and a third of a bag of marshmallows, with four packaged drinks. I figured that there had to be at least one thing in there that everyone would eat. 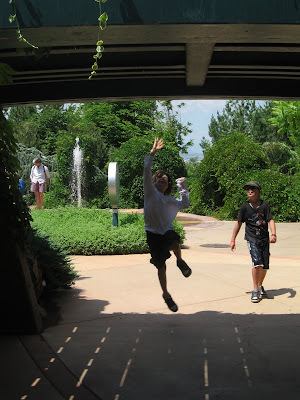 We headed up to Hogle Zoo. Luckily it is five minutes from my house. Unlucky for us, every family in the state of Utah had the same idea that I did, because there were people parking miles and schlepping their kids up the hilly streets to be able to go. One look at that and I kept right on driving. The kids got the picture when we passed the lines that stretched forever. We drove up to the park that is above the zoo. It used to be cool (to the kids) because it had all of this funky equipment that would make the kids super dizzy. We called it "The Throw-Up Park" because we had some near barf episodes with both kids after playing for a while on the equipment. But, I guess that some nut on the city council decided that it just wasn't boring enough (or maybe they had too many parents of true barfers complaining) so they ripped out all the cool stuff and now it's just another boring park that stinks and no kids want to play at. So, we drove by, and there was not another kid in sight. We kept on driving. 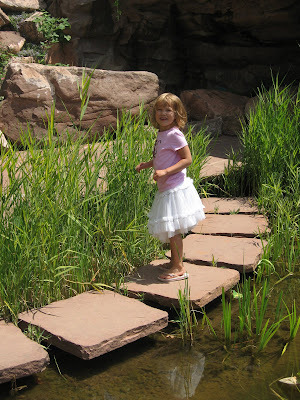 I headed a few blocks over, to what I thought would be another mad-house for sure, Red Butte Gardens, and to my delight- it was perfect. I forget that this is truly an undiscovered gem among most Utahn's. So, we unloaded kids and shuffled in. It is breath-taking. More species of plants and flowers that you can imagine, beautifully landscaped, and cared for by swarms of employees and volunteers, all for your sensory delight. 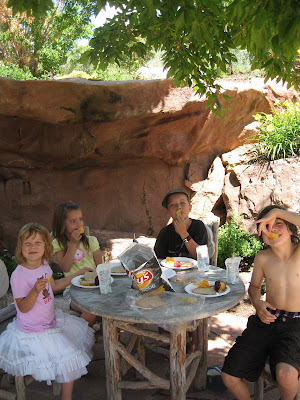 We headed up to "Granny's Garden" where we found a perfect little wooden table and I set up lunch for the bunch. There were some ooohhh's and aaahhh's and mostly in the way of "Ooooh, there is no way I am eating that!" and "Aughhh, I don't think so." But, hunger won out. All of a sudden the wheat bread was delicious when you dripped plum juice on it! And the chicken was so good when you put two chips on either side of it. And you would have thought that two marshmallows was Edmond's Turkish Delight from The Lion The Witch and The Wardrobe. They would do anything for those two little puffs of love...including eat all their food. After lunch in our secret garden, they moved out to a fountain that shot out of the ground. The boys could not resist and ran through, fully clothed. Luckily the day was warm so they dried relatively quickly. The girls were a little more wise, and just observed as they nibbled their marshmallows. 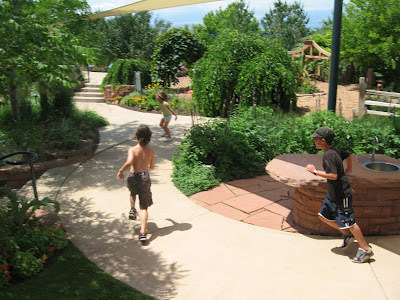 They played tag in the Butterfly garden, as they chased each other through a "snake" that was constructed of metal and covered with Virginia Creeper. 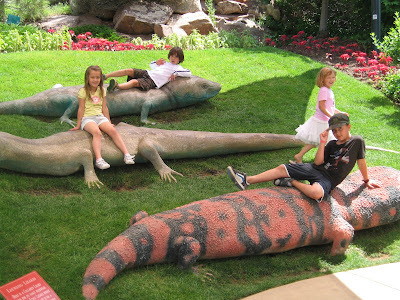 They climbed on Lizards, and ran through groups of wild roses and herbs. We left with Dalton saying that Red Butte was much more fun (well, "funner" to be exact) than the zoo. We dropped the friends off at their house and returned home to find Garrett was awake and ready for an adventure of his own. We packed a few towels, and we all headed to the JCC. 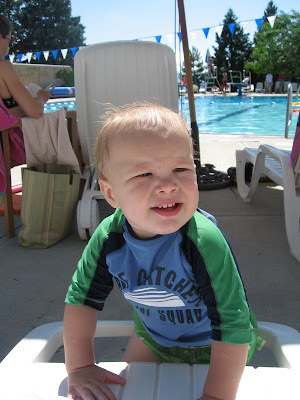 This was Garrett's first trip to our swimming pool, and he was in heaven. Snack bar goodies, like Mom's yogurt parfait, Dalton's fries, and Shelby's Cheetos. Only a swim diaper restricting his glowing little body from all surfaces, water, water and more water. He was having sensory overload, between the Top 40's hits blasting from the speakers, the kid fountain spraying down water, and hundreds of brightly clad kids buzzing around the place...hello baby heaven. 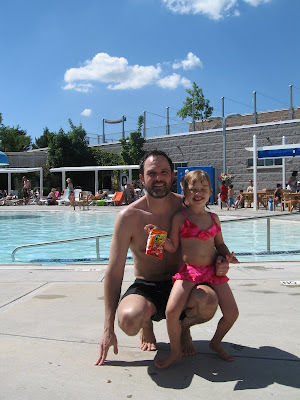 We splashed, and swam, and visited with friends. Shelby pretended to be a Portuguese Water Dog and I threw a ring to her about a hundred times. Gavin snuck in to the gym to get in a work out while we were entertaining ourselves. The only downside is that every hour the pre-pubescent life-guards blow their whistles and the whole pool has to clear out for ten minutes. What the!? Yeah, try explaining that to a 13 month old! I finally let him dip his little piglets in for the ten minutes, figuring that I would fight any 13 year old who would challenge me on this one. The day stayed sunny...one of the few this summer that has not ended with a wild twenty minute summer thunder storm. The kids swam their guts out until they could barely keep their eyes open. We drove home with tanned skin that felt a little taught, stretched over our bones...warm and tight. We didn't shower, so we smelled of chlorine, and the kids eyes were bloodshot from forgetting to wear their goggles. I had to hit every pothole on the way home, to ensure that the kids did not fall asleep. We ate salmon and corn on the cob for dinner, outside. We had rootbeer floats for desert. Garrett swung in his brand new bucket seat swing. We went for a bike ride with the two little kids behind me in the Burley chariot and Gav and Dalton on their bikes. We zig-zagged through the neighborhoods, peddling around the tree lined streets, admiring people's green thumbs and waiving to smiling faces sitting on porches. We stopped at the rival Elementary School, who has a much better playground than ours. I repeated to myself that I must get our school a playground like this...shade, a bike path, and benches. We played tag, Dad and the kids played tether ball. We rode around the path and Dalton and Gavin raced each other. Garrett ran, and ran and ran. When bonkings occurred and tears started up, it was time to go. So we loaded up the Burley, with Garrett protesting loudly about being restrained. We rode home, and had to stop multiple times so that Shelby could admire neighbor's dogs. Shelby guessed that a puffy brown dog was a lab. I told her no way, that it was a poodle. Turns out it was a Labradoodle. That's what I call both being half right. We returned a little rat dog of some sort to an owner, when it began to follow us down the street. Gavin was getting impatient and said "No more stopping for dogs." I told him that his attitude was "Poopy". That shut him up. No one wants to be accused of having a "poopy attitude". Kids got pj's on and went hesitantly to bed. It was too late for showers tonight. Dalton stayed up with Dad and Mom to watch half of a movie. Then I let him stay up for another thirty minutes to watch a PBS special on what it means to be an American. We watched a refugee family from Burma, arrive at the Salt Lake City Airport, and try to acclimate in to this culture. We watched an Indian woman testing for her citizenship. We watched other people; artists, religious folk, gays, Native Americans, Military people- tell their stories of what "being an American" meant to them. Dalton was worried about the Indian woman. It showed the interviewer asking her the questions. He asked if she was a terrorist, or a Communist. She timidly answered "No" to both. Then he asked when the Declaration of Independence was signed. Dalton asked what would happen if she got the answer wrong. I told him that I didn't know. It seemed stupid to me. I mean, how many people who were born in America even know the correct answer to that one? You would think that July 4th would be the correct answer. But it's a trick question. July 2nd is when the Declaration of Independence was really accepted. The signatures came at different times. Changes were made to the original. And copies had to be made to be distributed to the people. And so, it always irked John Adams that the 2nd was not observed as the holiday, but rather the 4th. In his journal, he writes how the 2nd will be remembered for generations. /It must not have made him too mad, since he and Jefferson both chose that day, fifty years later to die. Back to the point- who cares? It's just a day. Could it mean the difference to this poor woman as to whether or not she becomes a citizen? I hope not. We never found out. The show ended with an image of her sitting outside the office, waiting to receive word...lame. So, as for today- lovely. No expectations, sun shine, blue skies, happy kids, a husband off work, and all the time in the world. It was everything I didn't think it would be. Tomorrow, I will be happy that I live in this country, but no happier about it than I was today.